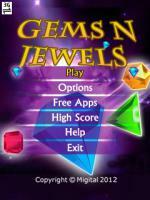 Make groups of different gems & jewels in your mobile and score points. Make groups of these precious stones in your mobile by swapping them. It will not only keep your game going but also will get you score to go to the next level.